Dolph Ziggler's got a lot to answer for. Mainly, at the moment, anybody that still considers him WWE's newest reliable pair of hands for a debutant. Because two pretty high profile balls ups in 2017 have suggested otherwise. 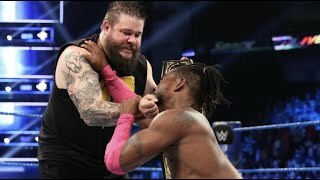 His Hell In A Cell clash with Bobby Roode was knowingly hamstrung by card placement and a lousy finish, but Ziggler, Nakamura, the agents and just about anyone that had a thing to do with this Backlash opener deserves a demotion to 205 Live, assuming Enzo Amore hasn't rendered it a lesser punishment in recent months. It was almost impressively boring, considering Dolph's propensity for an oversell, Shinsuke's wicked kicks and the fact that the pair had wrestled each other 19 times with the cameras off between Nakamura's first appearance on television and the May supercard. Presumably in no point during those matches did they work that formula, instead looking towards a WWE babyface beatdown match. It foreshadowed a frustrating first few months on the main show for 'The King Of Strong Style', but shouldn't have even exposed the smallest weakness. . Both could have done so much better, and despite what he may think, 'The Show Off' definitely can't do best.